But the accuracy of its targeted landing site is questionable. Updated on 1/20/2015. Before MSL landed on Mars, NASA’s Dr. Prasun Desai issued a challenge in a paper entitled ALL RECENT MARS LANDERS HAVDE LANDED DOWNRANGE – ARE MARS ATMOSPHERE MODELS MIS-PREDICTING DENSITY? MSL had a controlled entry that allowed it to pretty much land on target. Dr. Desai assumes that because the previous four landers (before his 2008 paper) on Mars landed downrange, the atmospheric density profile must be less than predicted. This, of course, is the opposite of what all our research about the Martian atmosphere indicates. We pointed out that Desai only requested help in explaining four spacecraft landing long. It was possible that three other craft listed as lost (Mars Polar Lander and Deep Space 2 on December 3, 1999; plus Beagle 2 on December 25, 2003) actually landed short and crashed as a result of it. But, alas Beagle 2 has, after 11 years finally been found (see Figure 1). The question is did it land long or short? The answer, sadly, so far depends on who you want to listen to, and a still unclear final course heading as Beagle descended (see Figure 2). Hopefully these problems will be cleared up soon. The British are claiming that they only missed a perfect landing by 5 km. I ran quick calculation based on a Bridges et al. 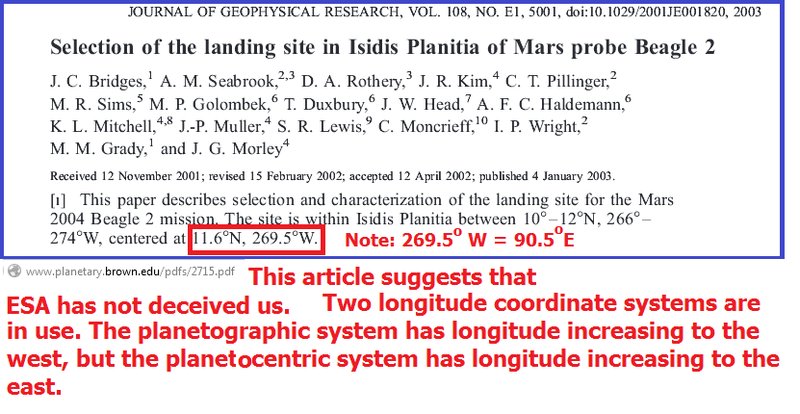 paper in 2003 (see Figure 3) and I came up with a very close figure (6.02 km - see Figure 4). But by using coordinates I found in Wikipedia on January 17, 2015 the distance looked more like 214.48 km (also see Figure 4). Another set of target coordinates on line yielded an error of 162.39 km (also see Figure 4). We found published differences in the size of the landing ellipses that varied from 50 km to 500 km (see Figure 5 which is adapted from Figure 2 of the Bridges et al. paper). The larger the ellipse the easier it is to claim that a near bull's-eye was achieved. See the relevant disputes on Table 1. Figure 1- Beagle 2's final resting place with partially deployed solar panels seen. A point at 12.9°N 88.00°E in Isidis Planitia, a large flat sedimentary basin that overlies the boundary between the ancient highlands and the northern plains of Mars, was chosen as the landing site. Figure 2 - Alternate Beagle 2 target coordinates originally published in Wikipedia and elsewhere. The real problem is where the alternate target coordinates came from and whether there was pressure put on Wikipedia to revert back to the set proposed by Bridges et al. We have often documented by print-screens NASA Mars weather data that they altered after we showed serious problems with the data. In the case of the Wikipedia Beagle 2 targets coordinates that went missing (12.9 degrees North, 87 degrees East) all that I captured (and inserted into Figure 2) was the link shown on Google. Figure 3 - This Bridges et al. 2003 paper appears to show target coordinates that are very close to where Beagle 2 was finally found. Figure 4 - Beagle was eventually found at 11.5265 degrees North, 90.4285 degrees East. These coordinates may also be expressed as 11 degrees 31 minutes 35.4 seconds North, 90 degrees 25 minutes 42.6 seconds East. The 2003 Bridges et. al. article has a target of 11.6 degrees North, 269.5 degrees West, but the latter longitude coordinate equals 90.5 degrees East. Wikipedia first showed target coordinates of 12.9 North, 87 East, but after Beagle 2 was found, they altered a critical sentence to indicate 11.53 degrees North, 90.50 degrees East. Where did the coordinates of 12.9 North, 88 East come from? Also Wikipedia at http://en.wikipedia.org/wiki/Beagle_2#Background. Apparently when Beagle 2 was found, Wikipedia went into overdrive in rewriting their Beagle 2 article. At one point on January 17 they offered the 87 degree East longitude, and later the same day it was given as 88 degrees East. Their final statement was, "Isidis Planitia, a large flat sedimentary basin that overlies the boundary between the ancient highlands and the northern plains of Mars, was chosen as the landing site and a 50 by 8 kilometres (31.1 by 5.0 mi) ellipse centered on 11.53°N 90.50°E was selected." 4. Sims, M. R. (2004). Beagle 2 Mission Report. Leicester UK: University of Leicester. p. 1. ISBN 1898489351. Figure 4 - Beagle was eventually found at 11.5265 degrees North, 90.4285 degrees East. Figure 5 - Adapted from Bridges et al. (2003) Figure 2 - Landing ellipses for Beagle 2. The area where the Beagle 2 was eventually found after 11 years is pointed to be a red arrow. ARE WE BEING TOLD THE TRUTH ABOUT BEAGLE 2? The Commission of Inquiry, which included senior managers and experts from within Europe and also NASA and Russia, held several meetings in the UK and in ESA, interviewing the key actors, directors, managers, scientists, and engineers, who participated in the development of Beagle 2. The report has been submitted to the UK Minister for Science and Innovation and the Director General of ESA and accepted. No single technical failure or shortcoming was unambiguously identified but a few credible causes for Beagle 2’s loss were highlighted. More importantly, the Board made it clear that there were programmatic and organisational reasons that led to a significantly higher risk of Beagle 2 failure, than otherwise might have been the case. The scope of the Inquiry covered a wide range of important issues of concern to the UK, ESA and other Member States in ESA. Some of these matters are necessarily confidential between governments and the Agency and cannot be released. Furthermore, the development of Beagle 2 entailed close working relations between many firms in the UK. Many of those firms invested their own funds in the project and formed relations which remain commercially sensitive. Although deciding that the Report should remain confidential, we believe it is important that the full set of Recommendations is published together with our appreciation of lessons learnt. We have often seen NASA/JPL alter MSL weather data after we altered its public relations man, Guy Webster, about serious problems. In some cases the published data was simply changed to “Not Available.” In other cases, JPL took data that was off the expected curve, and simply put it back on the curve. Wikipedia would have been more credible if they mentioned the coordinates they gave before, and then explained why they altered the data. In short, the coordinates “put there” were not consistent, NASA/JPL has a track record of manipulating MSL weather data, and the possibility of sabotage of Beagle 2 must be investigated. At one point Russia accused the United States of sabotaging its Phobos Grunt mission (see our article about that at http://davidaroffman.com/custom3_38.html). Further, it is hard to understand how Beagle 2 could have sat intact so close to the planned landing coordinates, and yet not have been successfully photographed from orbit for such a long period of time. It is much easier to understand why the lander was not found for so long if it were 214 km off target. In summary, NASA’s Dr. Prasun Desai put out a request for help in explaining four landers that were downrange of the planned target. If the new Beagle 2 story is right, the British basically scored a bull’s-eye, with the lander detached the Mars Express not in orbit, but in fact five days before entering orbit. However touchdown was 214 km off target; that would compare unfavorably with the downrange landings of 27 km (Pathfinder), 13.4 km (Spirit) 14.9 km (Opportunity) and 21 km (Phoenix). And if, indeed, Beagle 2 managed to survive a landing so far off of target, that would indeed say a lot about the density of the Martian atmosphere. Figure 6 - Beagle 2 with possible indications of its parachute and rear cover.